On Valentines day, the custom is to give away your heart. We fill heart shaped boxes with chocolates and give them to people – and we give other pink, red, heart-colored gifts to people. Valentines Day is about giving away our hearts. The first stage of progress on the path of devotional spirituality (bhakti-yoga) is “shradha.” Literally, this word means giving your heart. 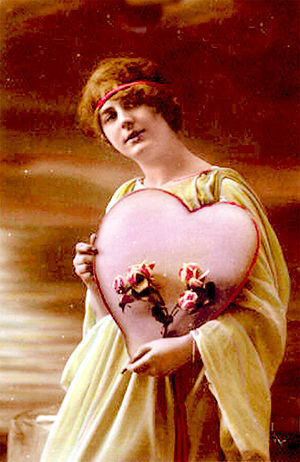 Taking a heart shaped box of chocolates and giving it to someone is a great illustration of shradha… giving ones heart. We don’t just give our heart to everyone and anyone. We give it to special people. To people we trust. Giving one’s heart to someone or something is an act of faith. The trust and faith is that this person who now has your heart in their hands will not reject it, will not break it, will care for it. How do you “care for” a heart? The heart is full of desires. To care for a heart means to fulfill it’s desires. What is the most essential of all your heart’s desires? The heart’s deepest and truest desire is to be filled to overflowing with love. We give our hearts to people in whom we have developed the faith, hope and trust to treat our hearts properly, filling them with affection and love, and thus bringing us true happiness. The first step on the path of devotion is the Valentines act, to give your heart. The perfect recipient is the heart of all hearts. The soul of all souls. The perfect recipient is the all-attractive one. He with no false-ego, no selfish lusts. He who is the source of all love. The heart of all hearts is the perfect person to give a valentines to. Giving to him automatically gives to all hearts, with bliss not pain because the heart of all hearts is also the source of all love. The most tender and careful of all lovers.